This is the quilt that I made for Sharon over at Lilabelle Lane in Australia. 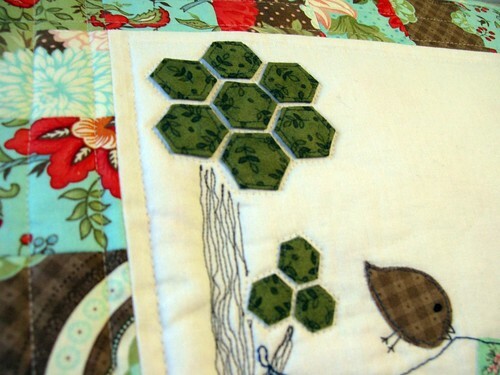 Sharon loves Bliss fabric and showed hexies and trees in her mosaic. I bought a scrap bag of Bliss fabric, but unfortunately it was mainly selvedge and only a few designs wide enough for the border. I have bought 3 scrap bags and only one has been without the selvedge. I know it is luck of the draw when buying on line, but I will be checking next time. Has anyone else used Moda Scrap Bags? .......and this morning mine arrived......I had hoped this one was for me...and when the "Security Declaration" also says "Chocolate"......I was v. excited. 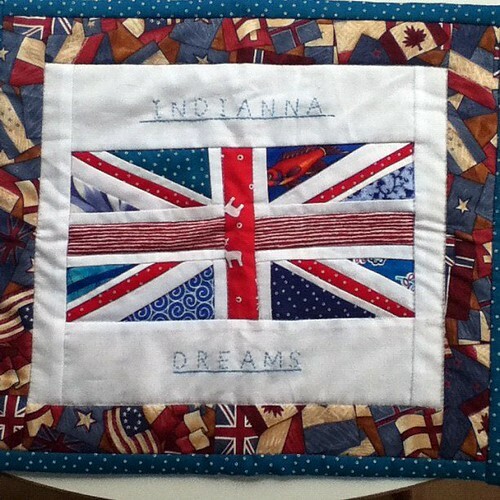 Thanks to Linda of Sew Nicely - it must have taken ages to piece all those little bits and the flag border complements it beautifully. Look at me......2 posts in one morning.....but I had pre-written this one - thanks to Instagram for the "instant to Flickr" photos. 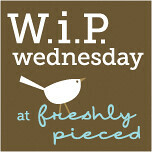 The rest of the day will be spent reading my new magazine and eating caramels....yummmmmmmmmyyyyy! I love the mini you made! Absolutely gorgeous. And such a lovely one received in return. Another good swap for you then. Enjoy. I loved doing the paper piecing for the flag and hope you like the fabrics in it. 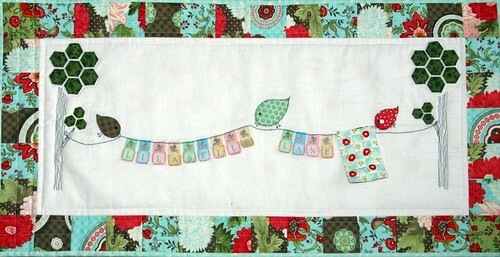 Your birdie quilt is gorgeous! I love the letters and stitching. 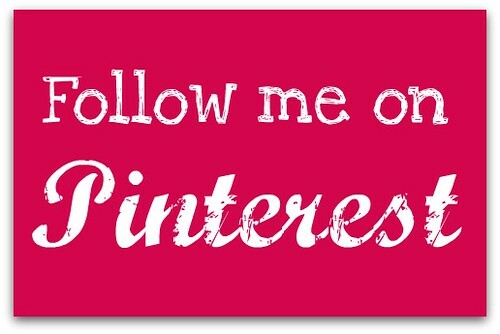 I absolutely do not mind at all and I am flattered that you liked mine. Thank you for sharing this with me. 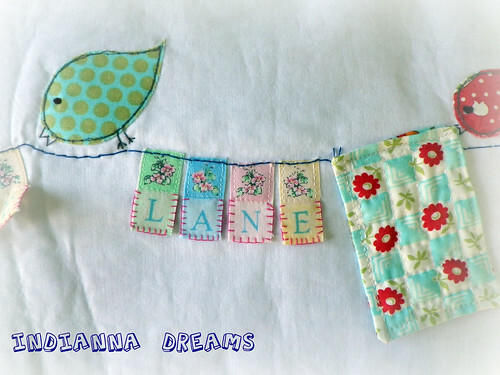 I love your Birdie quilt! I love scrap bags - I buy them because they include selvedges!!! do you have any you want to sell? The mini quilt you made is gorgeous - I love all the tiny details. You did such a beautiful job! You definitely deserve that delivery ;-) Enjoy! 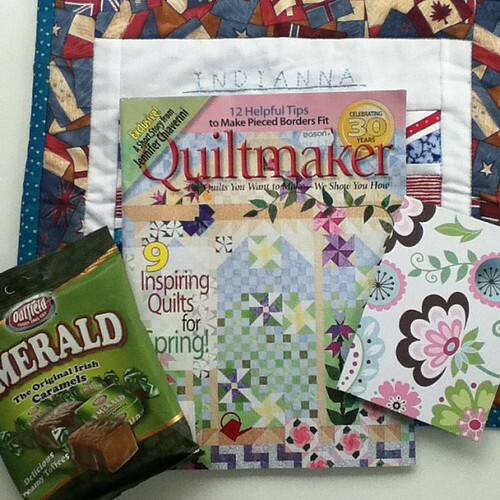 Looks like you had a great swap - love the idea of these little name quilts!